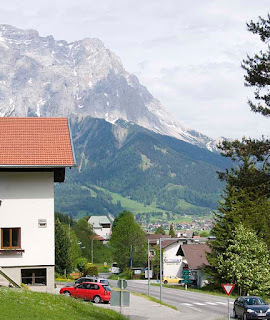 From Lindau, we quickly entered Austria and were soon lost in the craggy peaks of the Tyrols. There was no campsite in the vicinity of our next destination so that was going to have to be a hit and run and we needed somewhere to stay in the meantime. Campingplatz Lermoos Lärchenhof, a winter sports campsite, turned out to be it. A basic site in the yard behind the gas station in this tiny Tyrolean town of just over 1,000 inhabitants. Squeezed between the main route through town and the railroad track, it did have, electricity, water and, most crucially, Magnum ice cream bars. We were sold. After setting camp, we went walkabout in the village in the valley. We decided against taking the bicycles since every road we had seen in the area was too steep for us wimps to even contemplate. Tourism in Lermoos is a winter activity with numerous accommodations for skiers, ranging from grand lodges to hostels that seemed better suited to hamsters, and numerous restaurants catering to the same clientele. In mid-May, not too much was going on. I did keep an eye out for Heidi mit die lederhosen und die grosse Knockern but no luck there either. See views around town here. 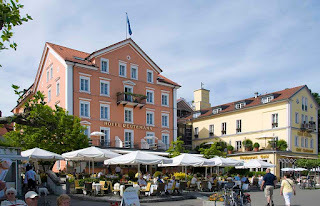 Lindau, in Bavaria, had been on our do-if-convenient list but, following Marian's interrogation of our German neighbors in Buchs, it was promoted to a must-do visit. So, back to Germany. Thankfully, I'm just the driver. 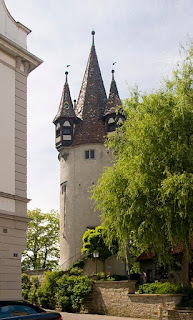 Lindau is a German town and stands on the only island in Bavaria. The island, which is just 0.26 square miles in size, is at the eastern end of Lake Constance, also known as the Bodensee. The earliest recorded mention of Lindau is 882 CE, although the remains of an early Roman settlement dating back to the 1st century have been found on the island. The town is close to the intersection of the Austrian, German and Swiss borders and Lake Constance is actually part of the Rhine at the northern foot of the Alps. The Rhine flows into the lake from the south and out again at the west end. The lake, Central Europe's third largest, is more than 1,300 feet above sea level, about 37 miles long and 8 miles wide at the widest point. Lindau, the medieval city on the island, with its relaxing location on Lake Constance, is a popular tourist destination. 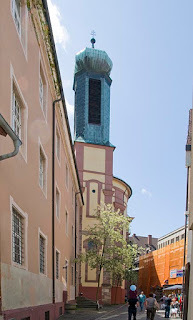 St. Stephan's church was founded in 1180 and in 1224 the Franciscans founded a monastery on the island. In 1853 a causeway was built to carry the railroad onto the island and supplement the existing road bridge. Three years later, the city built a new harbor complete with a statue of the Bavarian Lion and Bavaria's only lighthouse. For a quick tour, click here. The Buchs that we visited - there are several in Switzerland - is on the left bank of the Rhine in eastern Switzerland where the river forms the eastern border of the country. 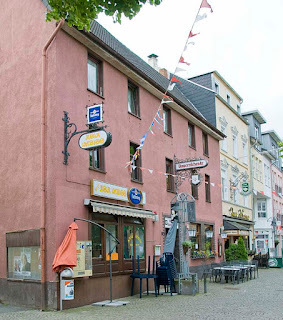 With a population of around 10,000, Buchs is a comfortable little burg built along the Rhine and fading into the steepening foothills of the Alps to the west. Language was quite trying, being about a fifty-fifty mix of German and French. This does not mean that half the folk spoke French and the other half German, but that each sentence contained about 50% German nouns and adjectives and 50% French. We never comprehended enough to even begin to decode the syntax. However, the campsite had a nice atmosphere, was handy to the town and the Mr. and Mrs. Santa Claus style of owners were very helpful. The biggest negative was the local church clock with its unattractive and very loud chimes that persisted 24/7. 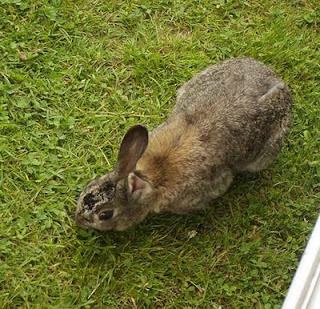 With a positive turn in the weather we stayed on for several days, this being the first real chance to get to know Penny and sort out her little peccadilloes. 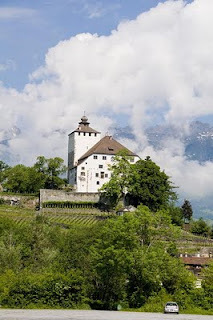 Across the river Rhine from Buchs lies the Principality of Liechtenstein, a diminutive, 62 square mile, doubly landlocked Alpine micro-state with its roughly 35,000 population. Liechtenstein is a constitutional monarchy, its capital is Valduz while its biggest city, Schaan, lies directly across the river from Buchs. 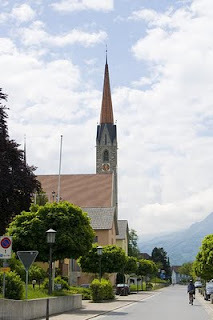 The country has a strong financial sector located in Vaduz, and has been identified as a tax haven although, of course, all that chicanery may soon end in tears - we wish. Check out the time warp here. From Basel, the River Rhine heads east (assuming, of course, one is heading upstream as we were) across the top of Switzerland and then veers south again to form the eastern border of the country. 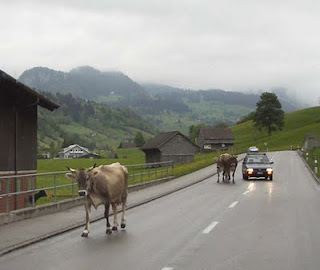 We decided to cut a diagonal course overland to the eastern border and take in the sights of Zurich along the way. Zurich and Geneva, Switzerland's two biggest cities and also her commercial powerhouses, both consistently appear near the top of the numerous "Most Livable City" lists, so Zurich had to be worth a stop, right? Well, stop we did. Traffic lights, traffic jams, road works, massive reconstruction projects and even being backed into by a ditsy Swiss Miss at a grocery store. Zurich had it all. All, that is, except any parking accessible to Penny, any campsite within 30 miles of public transport or any weather conducive to leaving our little home on wheels. Score another bust for Switzerland. Road pictures here. May 17, 2009 - How did we end up here? In common with many Europeans, numerous Americans and, come to think of it, most people we have ever met, we had no desire to go to Switzerland. Ever. Thus, it came as a bit of a shock when the Deutschland "D" on the rear ends of cars was replaced by "CH" plates. CH? Hmm. Oh, of course, Confoederatio Helvetica, why didn't I know that - we're in Switzerland, more specifically, Basel. The third most populous city in the country, at about 170,000, Basel is in the north west corner of Switzerland, on the river Rhine bordering France to the west, and Germany to the north. So, what's not to love about a country that is always ranked in the top few on every list of richest countries, every list of most desirable country to live in, a country that hasn't seen international combat since 1815, that cunningly stayed out of the EU, kept its own currency and speaks four different languages? It sure beats me, yet most respondants, when asked if they would like to visit there, produce an involuntary shudder and walk away. The Basel Münster, originally a Catholic cathedral, reformed into a Protestant church along the way, is the major tourist attraction in town and, surprise, surprise, is currently undergoing yet another refurbishment. 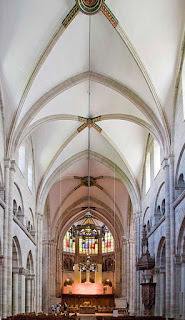 Most of the building dates back to the Romanesque structure of the late 12th century, completed around 1225. In 1356 an earthquake destroyed five of the church towers, various vaults and parts of the crypts. Thus far however, Switzerland failed to ring our bell. See the sights here. Officially, next Wednesday, Great-Grandson Henry will be one year old. Today was his birthday party. See pictures here. Approximately translated as Free Borough, Freiburg was founded in 1120 as a free market town, by Konrad and Duke Bertold III of Zähringen. 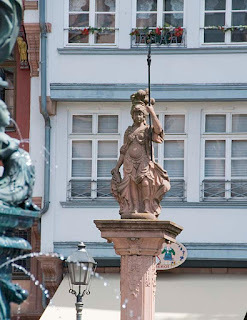 Straddling the Dreisam river, Freiburg has access to the rivers Rhine and Danube as well as overland routes to the North Sea and the Mediterranean. 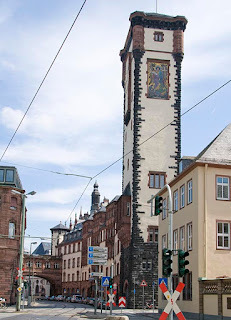 Silver mines in the area helped make Freiburg one of the richest cities in Europe, and in 1327 the city even minted its own coin, the Rappenpfennig. Along the way, Freiburg evolved from a mining centric town into a cultural center for the arts and sciences through the development of its university.The city was bombed twice during WWII, first by friendly fire in May 1940, when the Luftwaffe mistakenly dropped 60 or so bombs near the train station and killed more than fifty people and later, by 300 bombers of RAF Bomber Command in November 1944. The second attack destroyed much of the city center although, after the war, the city was rebuilt along the lines of the original medieval layout. At the centre of the old city is the Münsterplatz, the largest square in town, where a farmers' market is held every day except Sundays. The city has an extensive pedestrian zone where automobiles are banned and also has an effective public transit system, operated by the city. Great place for a walkabout. See more pictures here. 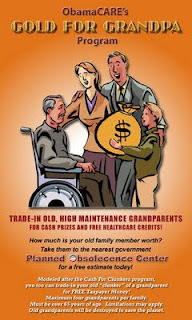 While we were in Europe earlier in the year it was leaked to us that August 16th was to be "Party Time" to celebrate the old fogies', us, 70th birthdays before the Gold for Grandpa program kicks in. Thus it was that last Sunday, relegated to the "wondering what the heck happened" category, we had a houseful of wonderful folk wishing us happy birthdays and attending to our every creature comfort. But, that was only half the story. As we were winding down this year's European trip at the end of June, we were quietly camped in a Dutch campsite called Bovensluis near the tiny town of Willemstad. 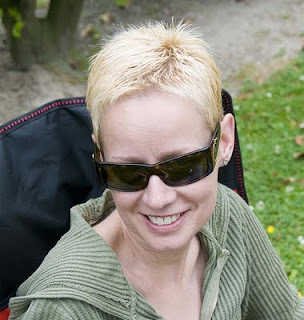 It was Friday evening, clean-up weekend before returning the van to storage in Numandorf, just across the river, and then flying home on Monday.Bovensluis has WiFi and it wasn't long 'til we received a cryptic email from #2 daughter, Michelle, currently living in London. "We need to see you. Will come to where you are." Intriguing. Following a flurry of emails and a few phone calls, Michelle and her Beau jumped on the Eurostar train in London on Saturday morning, and two hours later, arrived in Brussels, Belgium. There, they rented a car and were at the campground by early afternoon, having stopped in Willemstad to pick up a bevy of mysterious, but delicious Dutch thingies for lunch. So, why the palaver? The bottle of Champagne was the first big giveaway and was immediately followed by their announcement of their pending marriage in September. Needing no further excuse, we organized a fine celebratory dinner on the Willemstad Waterfront and, after breakfast on Sunday, the betrothed ones said "Goodbye" to Hubert, the camp rabbit, and returned to London.All of this brings us to how the weekend, just passed, came to do double duty. On Friday last, Michelle and Nick arrived in Fort Wayne and Nick met all the local family over the weekend, which included a pre-wedding dinner on Saturday. Sunday, they participated in goading the elderly in the birthday celebrations and on Monday, flew back to England. See pictures here.What a triumph! We had begun to believe that we would never get Michelle off our backs and here she is, almost married. Better yet, Nick, her intended, appears to be a useful kind of fellow who can lift heavy things and move furniture around - win-win as far as we can see! Not ones to leave things to chance however, we intend to see that they stick to the program. At the end of August we are going back to Amsterdam to pick up Penny, take the ferry to England and stand watch over the proceedings in London until we are convinced the deed is done. After that, we are going enjoy the English countryside for a few weeks to get over the excitement! 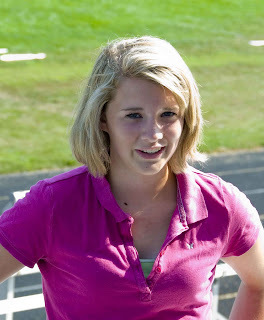 Today was family day at the Leo High School Marching Band practice. For the last month the students have been getting their act together for this, their first semi-public presentation. There was a good attendance of doting parents and grandparents along with a slew of less enthralled siblings. Thankfully, the program started at 11:00am, well before the day hit its high of 89F, the kind of temperatures the band has struggled with for the last few weeks. Good time had by all and, of course, Emily, one of our granddaughters pictured here, was the motivation for us to attend. For more pictures, click here. Once more we strayed from our Rhine mission. 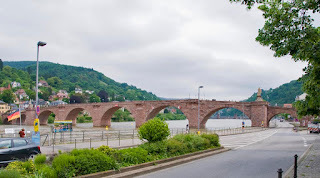 This time, 12 miles to the east, following the River Neckar - a Rhine tributary that connects at Mannheim - upstream to Heidelberg. The campsite was a further 5 miles to the east and, once more, was plumb on the river bank. Backstory of how we got here. 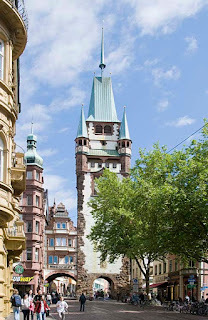 Heidelberg has a population of around 140,000 and, of the employed inhabitants, more than 88% work in service industries, quite unlike the mix in Mannheim a few miles to the west. The University of Heidelberg, founded in 1386 by Rupert I, Elector Palatine, has about 26,000 students on campus, bringing significant energy to the city. See pictures around town. Mainz is actually at the confluence of the rivers Main and Rhine and put us back on course for our meander up the Rhine. The campsite was on the right bank of the Rhine in Wiesbaden, right across from Mainz, and, like so many other riverside camps, was in the flood plain. Johannes Gutenberg, probable inventor of the moveable type printing press, was born in Mainz and also died there. For that reason alone, this mid sized town was on our radar, although it had much other promise as well. We strayed away from the River Rhine briefly, heading east along one of its tributaries, the River Main, to Frankfurt am Main, the fifth-largest city in Germany. The city population is around 670,000 with the urban area coming in around 2-1/4 million. The river Main is shallow enough to ford in places and, since the Franks were early inhabitants of the town, the community became known as Franks furt (ford) and the rest is history. See Backstory. Frankfurt is both the financial and transportation hub of Germany, the largest financial center in continental Europe, the seat of the European Central Bank, the German Federal Bank and the Frankfurt Stock Exchange. It is also one of just three cities in the entire EU with a significant number of skyscrapers (> than 500 feet high),being equal second with London at 10, and second only to Paris with 14. Frankfurt also has the highest concentration of lawyers in Germany, with one lawyer per 99 inhabitants, the Frankfurt International Airport is the single largest place of employment in the whole of Germany. 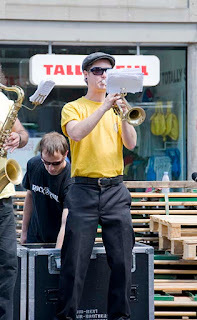 The Zeil, a pedestrian only street, is Frankfurt's main shopping street and one of the most crowded in Germany. For fifty years following WWII the American Forces Network broadcast from Frankfurt, before being moved to Mannheim in 2004. Sadly, WWII destroyed most of what had been, the largest medieval center in Europe, in addition to killing more than 5000 residents. See Slideshow. In general, post-war construction paid scant attention to restoration and much of the rich history has been lost forever. 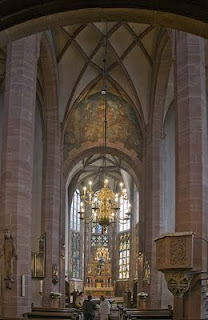 The Gothic Dom Sankt Bartholomäus - Saint Bartholomeus' Cathedral - was built during the 14th and 15th centuries where, from 1356 onwards, kings of the Holy Roman Empire were elected, and later roman-German emperors were crowned. The cathedral was destroyed by fire in 1867 and subsequently rebuilt in its present style. It too, suffered major damage during WWII. Originally formed from several of nine house purchased by the city in 1405, City Hall was partly destroyed in WWII and has since been restored. The complex includes the Kaisersaal - Emporers Hall - where freshly minted Emporers held their parties. St. Paul's Church, near the City Hall, is a revered national monument in Germany with great political symbolism. 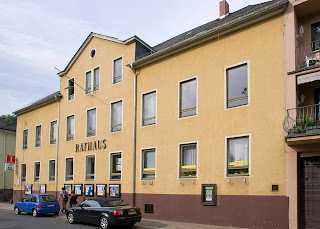 Begun in 1789, it was established as a Protestant church, although it was not completed until 1833. 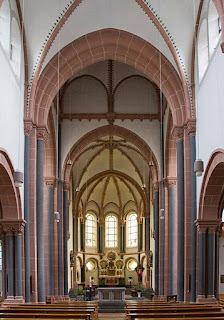 Its importance lies in the Frankfurt Parliament, which met in the church in 1848 to 49 during the foundling throes of the forging of Germany as we know it today. Afterwards, the building was used for church services again although it has long been deconsecrated and is now used for exhibitions and events. In 1885, Sankt Goarshausen had a population just shy of 1500. A century and a quarter later, the population has expanded to almost 1600 and the town has become increasingly dependent on tourism and wine-making for its existence. 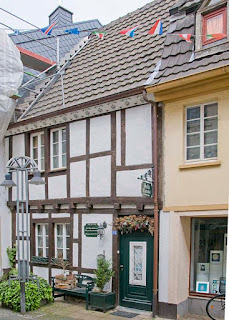 Squeezed onto the eastern shore of the Rhine in the section known as the Rhine Gorge, and directly across the river from Sankt Goar, Sankt Goarshausen is about 18 miles south of Koblenz. Two worthy attractions in the area are the Lorelei Rock and Burg Neu-Katzenelnbogen, locally known as Burg Katz. The Lorelei rock, a 400' slab of rock, jutting upwards out of the river bank, is a natural phenomenon making for hazardous river navigation resulting from the narrowness of the remaining passage and extreme currents in the water. Burg Katz, built originally in 1370, has been wrecked several times over the centuries, most recently by the French in 1806. It has since been rebuilt and is now privately owned. Pictures about town. Competition for tourist dollars is intense, not the least from Sankt Goar located directly across the river. Occupying a couple of miles along the river bank, St. Goarshausen also has two 14th century watchtowers from earlier fortifications at its southern end. Militarily, the two villages occupied a commanding location and Rheinfels Castle, on the Sankt Goar side, was for centuries, the largest and most imposing castle on the Rhine. Built in 1245, this castle ruled the river traffic and, in 1692, withstood an attack by 28,000 French troops. Ultimately, in 1797, the French Revolutionary army had their way and destroyed the castle, from which time its extensive ruins have dominated the hill over St. Goar. May 8, 2009 - Oh No, not another bridge movie! We had stayed in a campground some way from our intended target due to circumstances decribed in this Backstory. 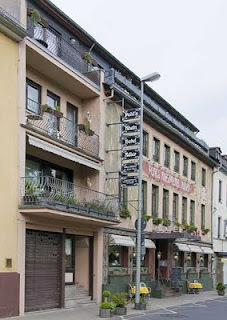 While Bonn may not have had too much to offer the casual tourist, it would have been of interest simply for its use as the German Capital during the forty years of German partition. The seat of government, of course, was moved back to Berlin following reunification. While perusing various maps for some inspiration as to what to do the following day, it transpired that Remagen was just a few miles down the road from the campsite. Remagen is on the River Rhine where, nowadays, there is a ferry that crosses the river every every 10-15 minutes in the summer. Views around Remagen. Late in WWI, the Germans built the Ludendorff Bridge across the river here, as a means of supplying their Western Front. Designed by Karl Wiener, the bridge was over 1,000 feet in length and cleared the water by more than 45 feet. Following WWI, the bridge was little used until WWII, when it again provided Germany with a supply line, this time for Hitler's Western Front. As WWII ravaged on, Rhine bridges became increasingly scarce until, by early 1945, the Remagen bridge became the sole survivor. The U.S. 9th Armored Division captured the bridge on March 7, 1945 while pursuing the fleeing Wehrmacht army. In retrospect it seems, the capture of the bridge appears to have been limited to a huge PR and morale boosting coup, with few tangible tactical or strategic benefits. In fact, only a limited quantity of Allied materiel made the crossing before the bridge collapsed on 17 March 1945, with the death of 28 U.S. soldiers. Much has been written on the subject of the bridge with Ken Hechler's 1957 The Bridge at Remagen, being perhaps the most widely known. The 1968 David L. Wolper movie of the same name, did get some of the local history correct but the WWII action in the movie was entirely fictional. The Romans are believed to have been the first to bridge the Rhine during the period that they had a fort in Remagen. They actually had two bridges in the area which, after spending three weeks on the east side of the river, they promptly dismantled again. Guess they didn't care too much for Germany. There has been no bridge at Remagen since WWII, but the bridge towers on the west bank have been developed into a Peace Memorial and museum, largely through the indefatigable energy of Hans Peter Kürten, long time former mayor of the city. Sadly, a shameful episode in political-military history followed on the heels of the wartime success at Remagen - the Rhine Meadow Camps. Also, checkout the Remagen Backstory. An SWMCCC Weekend - Fabulous! Each year, SWMCCC (South-West Michigan Council of Camera Clubs) holds a four day teach-in at Hope College, located in Holland, Michigan. The timing was great, fitting neatly into our nebulous schedule, and so we booked our places. Foolishly, as it turned out, we decided on dorm room accommodations and, to round out the college feel, opted for the cafeteria meal package - a second serious error! In 1847, Dutch Calvinist separatists, escaping from persecution in the Netherlands, founded the city of Holland. Like other Dutch centric cities in this area of Michigan, in Holland, if you ain't Dutch, you ain't much. Turns out however, that Holland is high in the national "place to retire to" rankings with pleasant summers, and winters somewhat eased by heated sidewalks downtown. Certainly, for the few days we were there, the weather was absolutely fabulous. The city population is about 40,000. 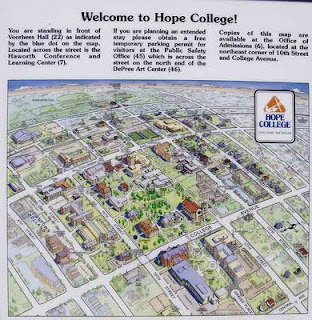 Hope College caters to about 3,300 students and, even though this is a small percentage of the overall population, their presence greatly influences the nature of the downtown area in the number and quality of restaurants, coffee shops and the like. The college itself extends into the downtown area and covers 120 acres overall starting one block from downtown. 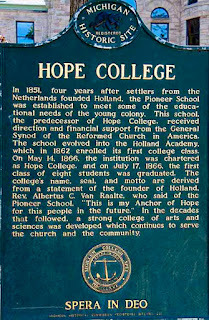 Hope is a private, liberal arts college, started by the (Dutch) city fathers in 1866 with a religious affiliation to The Reformed Church in America. Slideshow here. As for the program, it was splendid. Megabytes, megapixels, software, hardware, models-a-plenty, nerds everywhere and even some great images from 8:00 in the morning until 9:00 at night. Overall, tons of reasons to buy more stuff and stop worrying about ever understanding the last lot. Highly recommended. Read the Backstory here.